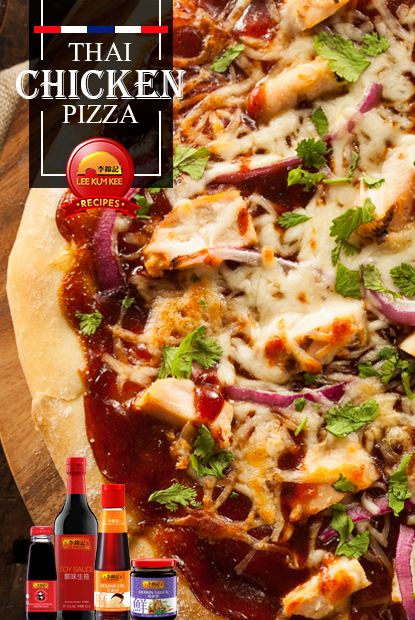 Bond with your kids and make pizza using the new 145g bottle of Panda Brand Oyster Sauce! 1. Preheat oven to 500 degrees for at least 30 minutes. 2. Combine sauce ingredients in a small pan over medium heat. Bring the sauce to boil. Boil gently for 1 minute. Divide into 2 portions for use on the chicken and pizza. Set aside. 3. Cook the chicken in olive oil over medium-high heat, stirring, until just cooked; 5 to 6 minutes, don’t overcook. 4. Set aside in the fridge until chilled. Once chilled, coat the chicken with ¼ cup sauce. Put back in the fridge. 5. Make the pizza. Using a large spoon, spread ¼ cup of sauce evenly over the pizza dough. Make sure to stay within the rim. 6. Cover the sauce with ¾ cup cheese. 7. Distribute half the chicken pcs over the cheese followed by half the green onions, bean sprouts and carrots. 8. Sprinkle an additional ¼ cup cheese over the toppings and top the pizza with 1 tbsp chopped peanuts. 9. Transfer the pizza to the oven and bake until crisp and golden and cheese is bubbly. About 9 to 10 minutes. 10. Remove pizza from oven and sprinkle 1 tbsp of cilantro over hot cheesy surface. 11. Repeat with remaining ingredients for a second pizza.